Now let’s begin. Make sure you have a stop watch for the timed drills. Before we begin typing, let’s go over a few things first-. because you will be graded upon your posture in the Proper Technique Evaluation form. 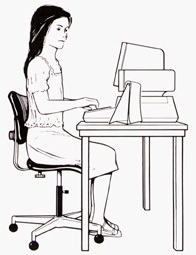 Sit straight with your back against the chair. Keep elbows relaxed at sides. Keep wrists low (but don't let them rest on the keyboard frame). Place fingers of left hand on A S D F.
Place fingers of right hand on J K L ;. Check drawing above to be sure you are using the right fingers on the right keys. Rest your right thumb lightly on the space bar. A S D F and J K L ; have a special name. They're called the home keys. Why? Because in touch keyboarding, you always start from these keys, and you always return to them. That way your fingers never lose their place--and neither do you. An anchor is a home key position that will help you bring each finger back to its home key position. Now look at page 3. Now practice using the space bar with the right or left thumb in the space provided. Check your position at the keyboard. Are your fingers curved over the home row? Are your arms, wrists, and hands in line with the keyboard? Are your elbows relaxed at your sides? Don't let your hands get lazy. Keep your wrists off the keyboard frame. Keep thumbs above space bar. Now on the bottom of page 3, E-Stroking Practice. Practice the F and J and space strokes in the drill. Each line one time. After completing a set of lines, return (hit the Enter key) twice. Now work on the F and J Keys. Each line once. Page 4. The D and K keys. Each line once. The S and L keys. Each line once. The A and ; (semi-colon) keys. Each line once. Now let’s see how you do for a 1 minute timed drill. This drill is only practice. You will need a stop watch and set it for a 1 minute. Bottom of page 4, Pre-test. Lines 11 – 12. Remember, keep your eyes on the copy. Now for the rest of the lesson. These last two sections, you will submit when you are finished. Page 5. Practice L. Lines 13 – 24 once. The final drill. Lines 25 – 26 for 1 minute. Note: The submit button has been disengaged.